Ekanta Seva is the last ritual among the daily sevas. Sarvadarsanam comes to a close with Ekanta Seva. Sri Bhoga Srinivasa Murthi, the silvar image of the main deity is seated in the Sayana Mantapam in a golden cot. During Ekanta seva, a descendant on Annamacharya sings lullabies to put the Lord to sleep. This seva is also known as panupu seva. Tarigonda vengamamba's harati (in a plate inlaid with one of the dasavataras on each day with pearls) is offered to the Lord. 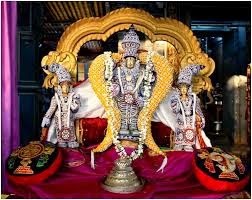 Bhoga Srinivasa occupies the cot for eleven months in a year and in the twelfth month of Dhanurmasa (Margali) Sri Krishna is put to sleep. IS IT POSSIBLE TO GET TICKETS FOR EKANTHA SEVA EITHER THROUGH ONLINE OR COUNTER TICKETS.